When you step into a theatre to see a play you normally put yourself into the hands of the playwright who crafted the original words, the actors who bring them to life, the director who shaped the performances, the set designer who creates a space for each scene, the lighting designer who pulls your eye hither and thither depending on the beams of light they shine across the stage, the sound designer who adds bass rumbles and background music to key moments, as well as the friendly host who checked your ticket stub and pointed you towards the seat and the people sitting on either side who may or may not check their phone and unwrap noisy sweet wrappers. Eliminate the set, the lights, most of the sound effects and the majority of the choreography and the stripped back performance becomes much more reliant on the words of the play and how they are voiced. As part of Belfast International Arts Festival, the Lyric Theatre’s New Playwrights Programme are showing off four new works by writers who have benefited from six months of dramaturgical support. 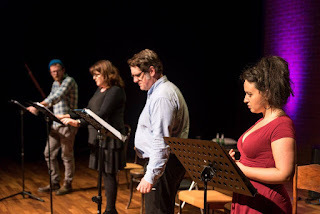 Last weekend there were read-throughs of Away With The Fairies by Seamus Collins and All Mod Cons by Erica Murray, both directed by Des Kennedy. This Saturday evening (7pm) and Sunday afternoon (2.45pm) another two plays will be showcased: Bloodlines by Vittoria Cafolla and Closed Shutters by Andy Doherty, both directed by Emma Jordan. The four cast members stepped forward to four music stands with their script folders for Away With The Fairies. Scene one. Laura Hughes and Dan Gordon were loitering at the side of an imaginary confessional box. Helen and Easy are founder members of ‘Prayer Club’ which has a deep concern for the souls and exploits of parishioners so they can feed into the spiteful chain of gossip that consumes the town. But Helen has heard about a “doirty” video made up on a hill outside town that stars Easy’s young niece Sarah. Uncle Easy’s nickname of ‘Sleazy’ is down to his wandering eyes (and maybe hands) but he’s a naïve, unsexed soul. Up to now has enjoyed a good relationship as guardian of his niece. Adele Gribbon plays sweary and offensive Sarah who works part time in a café and banters outrageously with her boss Nathaniel (Seamus O’Hara) who may take honesty pills at breakfast given. Over 80 minutes, this well-formed play explores the rift that forms between the normally cosy Helen and Easy as their backstories unravel. There’s a slew of coming out, attempts to destroy the hilltop statue that’s thought to be a pagan fairy goddess of female love and transmitting wanton feelings of gayness over the townspeople. Small town. Small minds. Within days, everything has changed, power has shifted, unexpected grace abounds, and the Prayer Club is shaken to its doirty foundations. Seamus Collins’ Away With The Fairies has great promise as a play with its distinctive characters, funny dialogue and surprising twists. Hopefully it’ll be picked up by a local company and staged in the near future. Tickets are still available for this weekend’s performances.